This quilt top is well on its way to becoming a full fledged postage stamp quilt. We used two jelly rolls and that was it. Pretty straight forward but lots of seams and pressing. A LOT of bobbin thread. If I were to do this pattern again, I would use 6 squares to a block instead of five. That way there would be one block (instead of an Block A and a Block B) and it would naturally alternate. I didn't realize until I put it on the bed for pictures how satisfying this project was. I am *almost* the proud owner of a postage stamp quilt. Eeee! The best part is, I made it. Am I crazy to think this would be perfect hand tied?!? Notice all the pins? 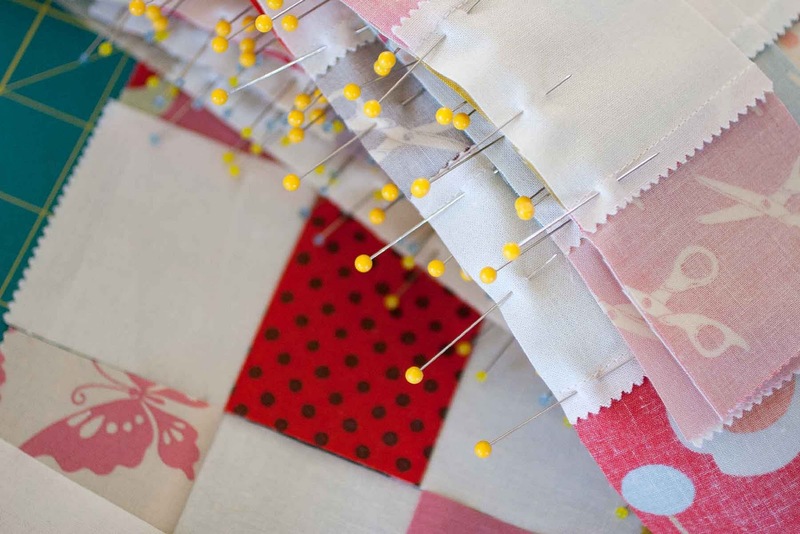 Pins are your friend for this quilt. 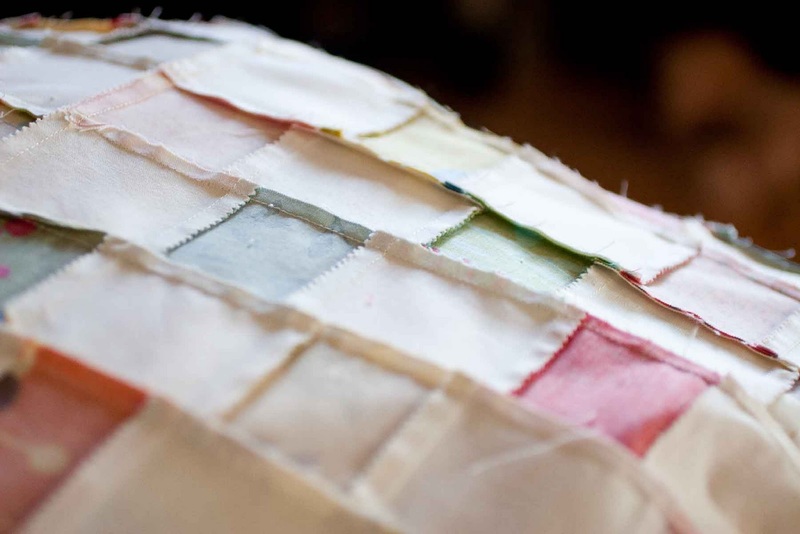 Pressing seams to the side helps line up all those tiny squares. Yes! I LOVE this too! 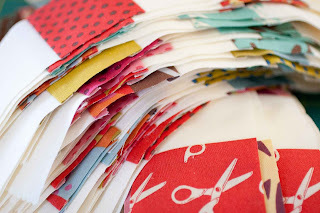 I have been totally confused on what to make out of my Wonderland jelly roll - you have totally inspired me! Oh yours looks fabulous. Wasn't it fun to do. and I so agree about the pins lol. How are you going to quilt it? Fantastic work! Just in case you finish up this quilt within the next week, I am hosting a quilt show/contest called the Love Nest Quilt Contest for modern bedsize quilts. Entries open until Feb. 9. 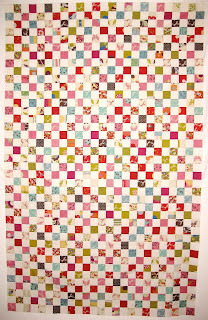 I'd love for you to enter this fabulous quilt! It is beautiful! I'm working on one too and love it! Your quilt top looks fantastic. I just learned how to hand quilt, and using the chunky threads add so much charm. :o) I am hooked!! Amazing! I am working on my very first quilt right now... I had NO idea how satisfying it was! Your Postage Stamp is awesome!! I agree, hand tied would be just right for it. Beautiful,simplicity looks really nice! I am glad you are making something you have always wanted to own.I wil be checking back to see it finished,I think the tied would be nice, let it drape naturally. 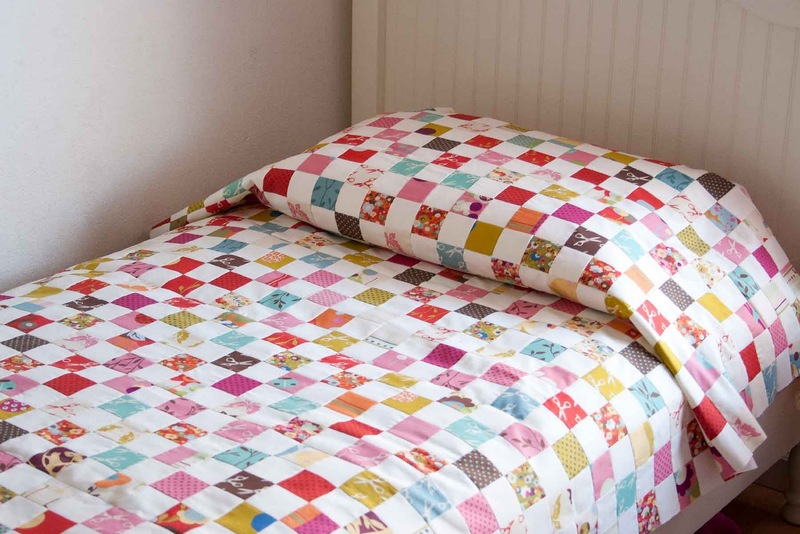 I'm totally into tied quilts. So simple! Tie it up! 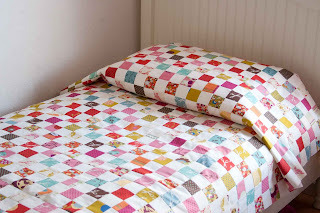 Such a fabulous quilt! I really hope to make one of these someday. Looking at yours makes me want to do one.....it is sooo wonderful! 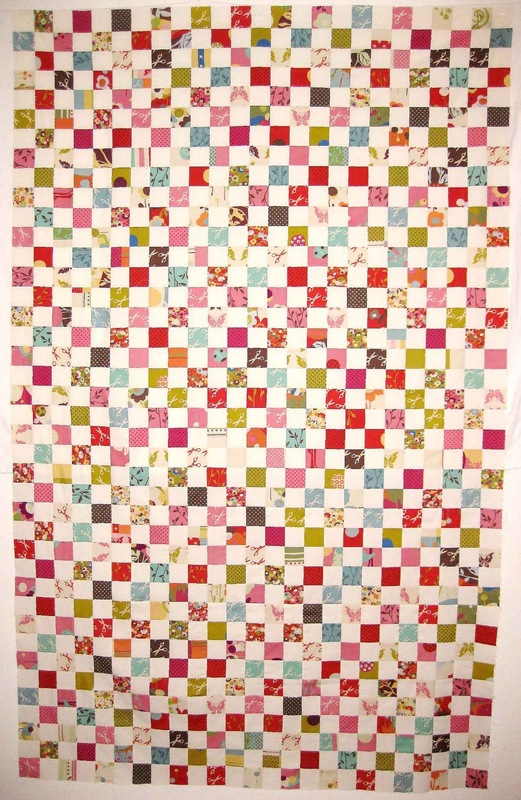 Really like the bright cheeriness of your quilt. I like it that your squares are slightly larger than a regular postage stamp. It makes the fabric show up well. It turned out fabulous! I'm so glad that you made the quilt you always wanted to have! It's perfect for you! Wow, it looks amazing on the bed! Now I want one! Looks great! I saw a few other people who mentioned doing ties as well, and I'm thinking about it for mine now. Of course, I still back sewing together my strips, so I'm WAY behind! So beautiful...and so much work! It looks so good! Amazing! I love the rainbowof colors too! You must have a ton of patience! Idon't think I could tackle something like this for quite a while, lol! I cannot wait to see how you'll finish it off! Your quilt is amazing! That is a lot of little squares....can't wait to see how you quilt it up when you finish it.